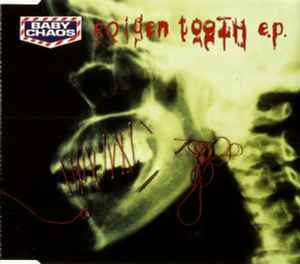 Baby Chaos ‎– Golden Tooth E.P. ℗ 1994 Warner Music UK Ltd. © 1994 Warner Music UK Ltd. The copyright in this sound recording and the artwork is owned by Warner Music U.K.
© 1994 Warner Music UK Ltd. The copyright in this sound recording and artwork is owned by Warner Music UK Ltd.
All tracks written by Baby Chaos & produced by Paul Johnson and Baby Chaos.